Mimosa Digital can print your advertisements, products and designs, or corporate artwork on canvas to be hung in your office or given to clients as beautiful artwork. Request a quote online by telling us the quantity and size. We will be in touch with you with a quote or to discuss your needs. To reach us by phone, call 201-222-1103. 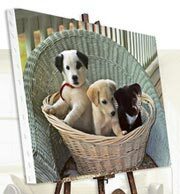 Regular rolled canvas is provided full-bleed on canvas with the finished sized based on the size ordered (no excess canvas on the sides). Gallery wrapped ready is overprinted approximately 0.75" larger on all 4 sides and provided with sufficient excess canvas to facilitate stretching on 0.75" thick standard stretcher bars. The canvas is delivered rolled. These rolled canvas prints can be gallery wrapped or framed and delivered as a completely finished piece. 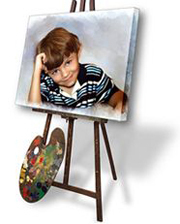 Canvas stretching and framing services are available only for pick-up. We currently do not offer shipping on canvas-streched or framed pieces. *Subject to availability based on quantity and time submitted; rush fee may apply. Canvas prints should be air dried then sprayed with a sealer after the inks are set (about 48 hours). Allow inks to set before framing to avoid fogging on the frame glass. For best quality and longevity, canvas prints should not be stretched until the inks and sealer are set. This takes about 7-10 days.